Last month, the Colorado Humane Society and the Dumb Friends League Harmony Equine Center™ assisted the Park County Sheriff’s Office with the removal of 57 neglected horses, including several pregnant mares, from three different locations in Colorado. Malnourished and severely underweight, the horses were in imminent danger and brought to the Harmony Equine Center for care and rehabilitation. Since arriving at Harmony, the horses have eaten more than 60,000 pounds of food, which equates to 30 tons in 27 days or 85 750-pound bales of hay! The collective group has gained 4,650 pounds since coming to Harmony. The overall health of the horses outside of their generous weight gains has also improved, including hair coat and hoof development, brighter eyes and alertness. Floating teeth on 24 horses with a goal to finish the remaining horses by early April with assistance from Colorado State University veterinary students. Providing immediate hoof care to 41 horses, and trainers working with the weanlings and pregnant mares to get them quiet enough to give the necessary attention to their feet. De-worming all horses except for the pregnant mares, which will be done after their foals are born, and it’s safe to do so. It will take months of physical rehabilitation and professional training before these neglected horses are healthy and ready to be adopted. 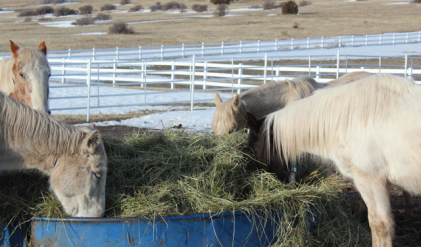 Please visit harmonyequinecenter.org or call 303.751.5772 if you would like to donate to help provide care for these horses. You can also learn more about these horses and become inspired by their story.